Canadian invader Button Down (GB) found the chilly and rainy conditions on Saturday afternoon at Churchill Downs to her liking as the 4-year-old filly swept past the leaders at the top of the stretch and held sway in the final stages to beat Lady Fog Horn by a half-length in the 42nd running of the $100,000 Cardinal Handicap (Grade III) for fillies and mares. Button Down (GB), owned by Greenwood Lodge Farm’s Carol and William McAlpin, ran 1 1/8 miles over a turf course rated “good” in 1:56.19. Josie Carroll was the winning trainer, and eastern-based jockey Paco Lopez rode a stakes winner at Churchill Downs for the second straight Saturday. He won the Mrs Revere (GII) last week aboard Isabella Sings. Invading Humor led the field of 11 fillies and mares through early fractions of :24.02, :48.85 and 1:14.94 with Button Down (GB) well placed early a couple of lengths off the lead. Button Down (GB) was fanned wide on the final turn, took command entering the homestretch and opened a clear advantage in the stretch before holding off Lady Fog Horn. Lacy (GER) rallied from far back but was another 3 ¼ lengths behind the runner-up to get third. Button Down (GB), who toted 118 pounds, paid $6.60, $4.40 and $3.60 as the 2-1 favorite. Lady Fog Horn, off at odds of 20-1 under Albin Jimenez and 115 pounds, returned $16 and $9.80. Lacy (GER), ridden by Joe Rocco Jr. who carried 117 pounds at odds of 23-1, paid $14. Street of Gold, Bitty Kitty, Annulment, Invading Humor, Faufiler (IRE), America Mon Amie, Wiener Valkyrie (GB) and Kiss Moon completed the order of finish. Emotional Kitten and Sistas Stoll were scratched. The Cardinal Handicap was the first graded stakes win for Button Down (GB), who banked $58,280 to improve her record to 14-3-6-0—$188,989. Prior to the Cardinal, Button Down (GB) was fifth in the Grade I E.P. Taylor over her home course at Woodbine. Button Down (GB), a bay daughter of Oasis (GB) out of the Sadler’s Wells mare Modesta (IRE), was bred in England by Juddmonte Farms. One race earlier, Windy Spa Racing Stable LLC and Bobby Robertson’s Bagg O’Day rallied in the stretch to beat W. B. Smudge by three-quarters of a length in the eighth running of the $82,625 Bet On Sunshine Overnight Stakes. The 4-year-old gelding ran six furlongs on a fast track in 1:09.91 under Joe Rocco Jr. for trainer Steve Hobby. The $49,247 first prize jumped the Kentucky-bred’s earnings to $243,541 from five wins, four seconds and a pair of thirds in 17 starts. He paid $8.80 to win. Alsvid, the 2-1 favorite, was third. JOSIE CARROLL (via telephone at Woodbine), trainer of BUTTON DOWN (winner): “She has just been an amazing filly. Every time she goes over there, she comes back better. “I was a little concerned that it was going to be too soft because of the rain that came down. I didn’t really know how deep it was going to get but I did talk to Paco [Lopez] and he said that the course was safe, but soft. We talked about how to ride her and he had a lot of confidence in her. He rode her very well. “I really didn’t know how good she might be but almost from the moment we started breezing her she was a filly that I was very surprised was still a maiden. When she came to me last year in Florida, I was really surprised she was still a maiden. For updated Road to the Kentucky Derby point standings, click here . 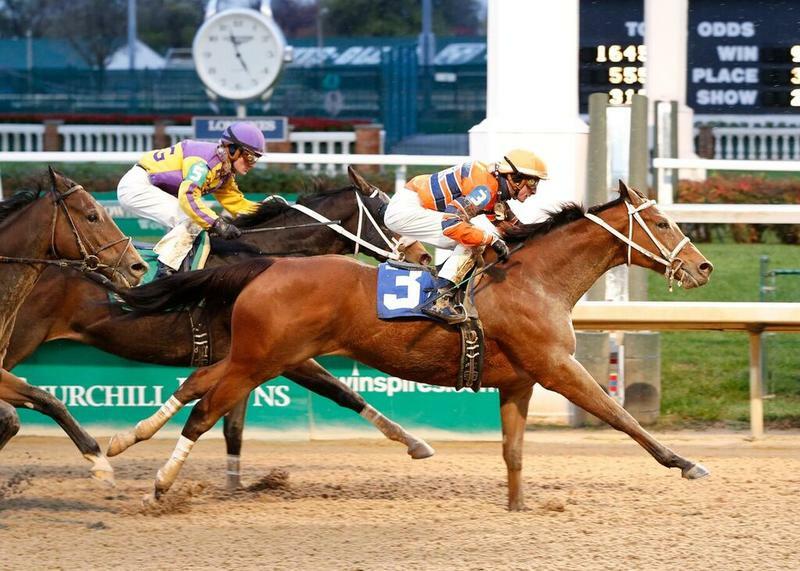 For updated Road to the Kentucky Oaks point standings, click here .